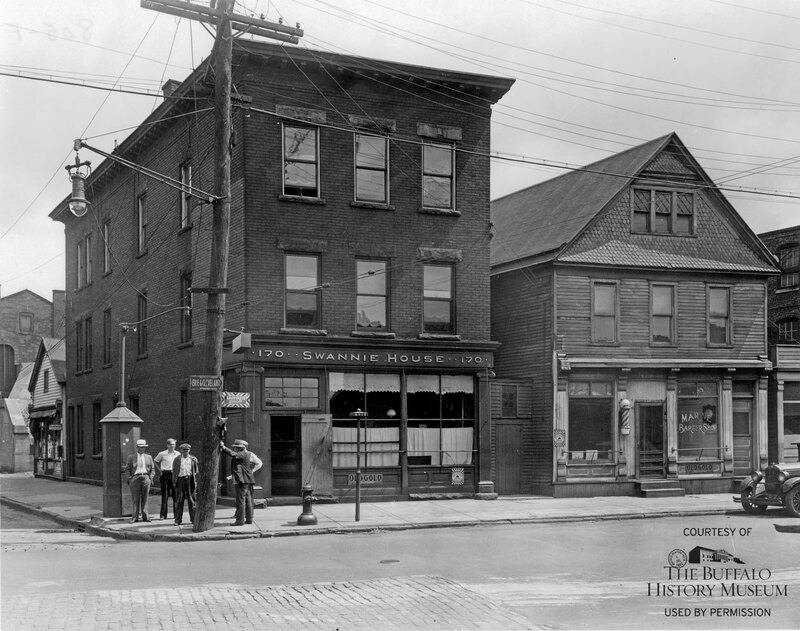 The Swannie House, 170 Ohio Street, is the second oldest continually operating tavern in Buffalo, established by Gibson Williams and John Swanerski at least as early as 1886. This image, taken circa 1925, looks north from the Michigan Avenue Bridge. Five men, one smoking a pipe, gather to chat on the corner. A sign above them, attached to a utility pole, points the way to Erie and Cleveland to the south down Ohio Street. The iron bridge of the Delaware, Lackawanna, & Western Railroad is partly visible behind the Swannie House on the left. On the right, a Hupmobile sedan is parked along the curb. Nearby iron foundries, machine shops, freight houses, and grain elevators and mills would have provided an endless supply of laborers to places like the Swannie House—at the time of this photograph, no doubt a speakeasy. In 1983, the Swannie House was purchased and renovated by Timothy Wiles, who continues to operate the tavern today.